Fortune report says that Robert Youngjohns (HP software boss) is assuming to take control over the cloud research and development and product management activities. With the better results from software sales, HP earned revenue of $4bn and are planning to develop for cloud computing management system as it will be handled by Mark Interrante. In this November HP is planning to divide into two entities, HP Enterprise and HP Inc. HP Enterprise will include Cloud computing organization. The HP Enterprise Group made a profit of $28bn from sales in 2014. It is supposed that HP will develop cloud storage features along with a hardware platform in order to increase the sales rate. These changes are done in order to focus on major market opportunities to align $1 trillion of the total addressable market. If these opportunities are served according to desired level, then it will help in achieving a new era in business entities. According to Whitman statement- Two applications must have different profiles and the requirements must be categorized according to the company demand. This will help in managing thousands of applications across different IT, Public and Private Companies. Whitman also said to organize the HP Enterprises in order to bring together all the pieces to the cloud so that there should be a holistic view from the data center. For this HP is maintaining alignment between the cloud and software products. 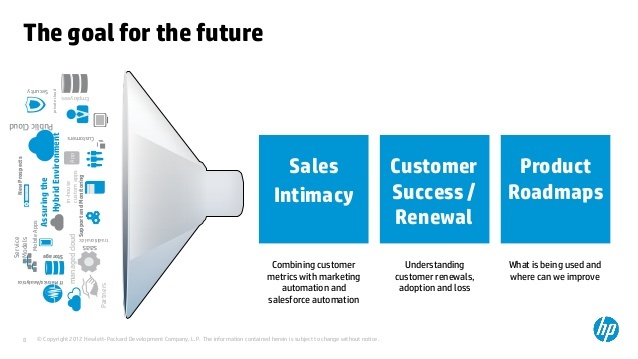 The CDI Sales and Presales teams will be engaged in making the EG sales structure by combining Cloud into EG Sales which will offer one face to the customer to carry the transformation, as said Whitman.